The Gilead Sciences Inc. (Nasdaq: GILD) stock price hit a 2016 high of $102.29 less than a month ago on April 25. Since then, shares of the biotech giant have plummeted 19.7%. As of Friday, May 20, the Gilead stock price currently trades at $82.81 a share. 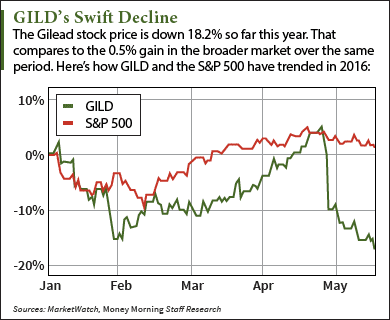 The sharp sell-off caused a number of analysts to downgrade GILD stock. On April 29, investment bank Maxim Group downgraded the company from "Buy" to "Hold." But Money Morning Director of Tech & Venture Capital Michael A. Robinson loves Gilead stock at its current price. He thinks shares are hugely oversold right now and believes they're a great investment for the long haul. In fact, he sees the Gilead stock price heading 35% higher over the next year for two important reasons. The biggest reason why Gilead Sciences stock has sold off recently is the company's disappointing Q1 earnings report. On April 28, Gilead reported Q1 earnings of $3.03 per share on revenue of $7.8 billion. According to analysts surveyed by Thomson Reuters, the company was expected to earn $3.15 per share on revenue of $8.1 billion. This earnings miss immediately sent the GILD stock price down 6% in post-market trading and began the month-long plunge. Gilead's poor earnings stemmed from declining sales of the Hepatitis C virus (HCV) drugs Harvoni and Sovaldi. The two saw sales of $3 billion and $1.3 billion, respectively. These missed estimates of $3.1 billion and $1.4 billion. And while Sovaldi's sales increased from $972 million in Q1 2015, sales of Harvoni – the more expensive of the two – declined from $3.5 billion in the same quarter. The company is also dealing with the latest outcome of a federal trial with competitor Merck & Co. Inc. (NYSE: MRK). Back in March, Gilead was ordered to pay damages for infringing on Merck's patents for various HCV treatments. Merck claimed two of its pharmaceutical patents were active ingredients in both Harvoni and Sovaldi. Gilead was ordered to pay $200 million. 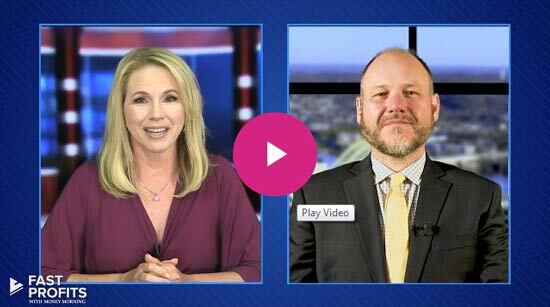 The company's CEO John Milligan said he plans to file for an appeal. Despite the lackluster sales of its leading drugs and ongoing legal battle, Robinson believes investors should buy Gilead stock in 2016. The first reason GILD stock will rebound is the company's dominance of the monstrously-sized HCV market. You see, the World Health Organization (WHO) reported roughly 130 million to 150 million people around the world suffer from a HCV infection. The Centers for Disease Control and Prevention (CDC) said 3.2 million U.S. citizens have it and roughly 17,000 new cases appear every year. And Gilead is poised to benefit the most from the growing number of patients. According to the company's filings, over 600,000 people around the world were treated with Gilead's HCV drugs last year. That brought total 2015 sales for the company's two HCV treatments to $19.1 billion. "Its HCV drugs Solvaldi and Harvoni are state-art-of-the-art treatments," Robinson said. "Gilead Sciences shows no signs of letting up and it's been a rising star because of its success in the HCV market." The second bullish indicator for the Gilead stock price is the firm's small debt load. Gilead is one of the few biotech companies with a tiny debt-to-capital ratio – measured by dividing a company's total debt by its total capital. As of March 31, Gilead boasts a ratio of 0.63 – lower than other firms like GlaxoSmithKline Plc. 's (NYSE ADR: GSK) 0.76 ratio and AbbVie Inc.'s (NYSE: ABBV) 0.89 ratio. That's why we think Gilead stock is a great long-term investment. In fact, Thomson Reuters analysts give it a one-year target estimate of $111.29 a share – up 35.5% from its last close of $82.14.